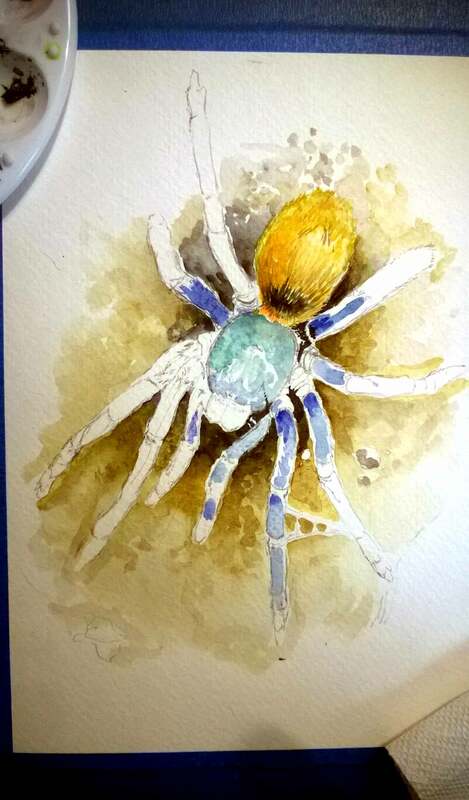 When I first began researching what type of tarantulas I might get to start my collection, I encountered a photo of a spider so colorful and beautiful, that I was at first convinced that it was a clever Photoshop creation. With its shimmering blue legs, metallic aqua carapace, and stunningly vibrant orange abdomen, this animal looked too striking to be real. 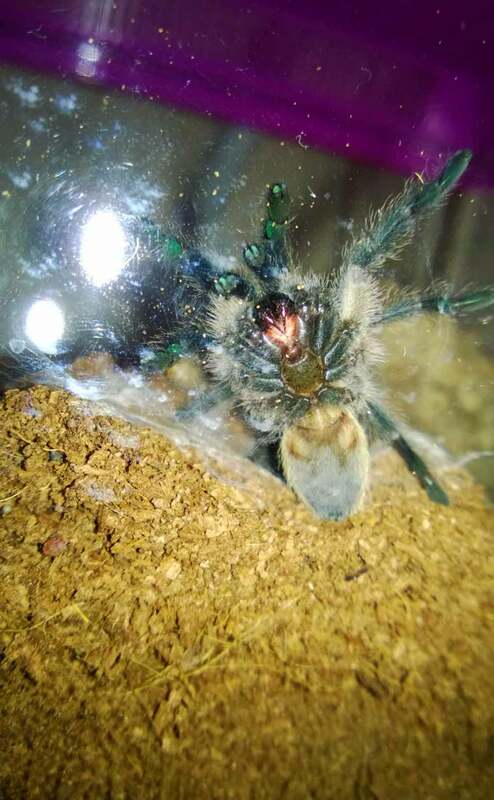 A quick search revealed this amazing specimen to be the Chromatopelma cyaneopubscens, common name Greenbottle Blue or GBB for short. Immediately interested, I began researching the GBB to learn care requirements, temperament, and cost. 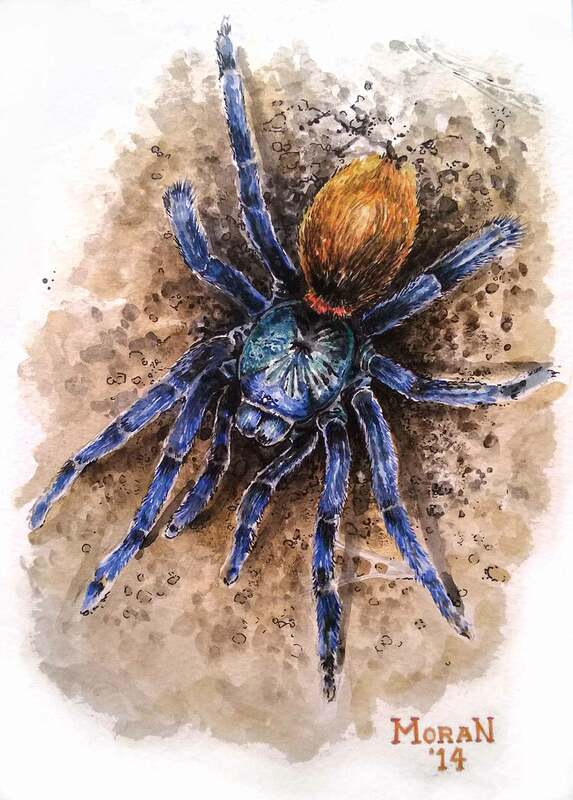 Surely this unique tarantula commanded high prices like the equally beautiful P. metallica? Or, being new to the hobby, would I be overwhelmed by this spider’s temperament or husbandry requirements? I was delighted to learn that, despite being a bit skittish and faster than many recommended “beginner species”, the GBB’s heartiness and ease of care made it approachable for someone relatively new to the hobby. And with .75″ slings costing around $35-$40, they were definitely affordable. GBBs originate from an arid, tropical desert region in Venezuela, where they live in heavily-webbed burrows under local foliage. When researching, I discovered many older accounts by keepers who said that GBBs were a fragile species that was difficult to keep alive in captivity. 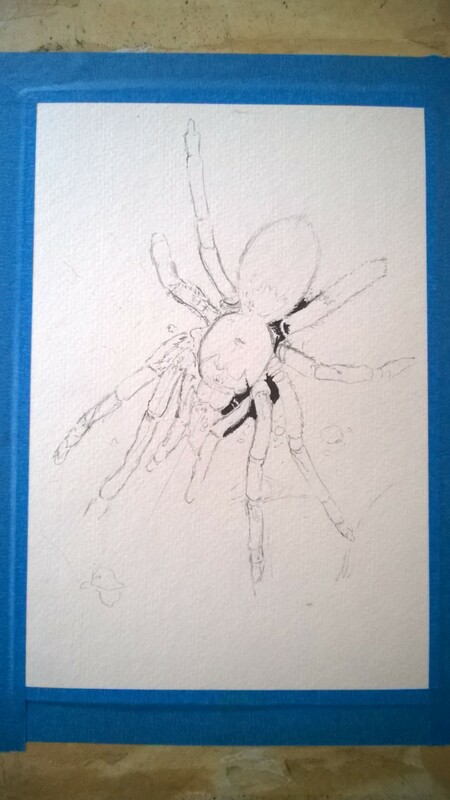 For years, many kept this spider in moist enclosures with damp substrate and constant misting. As GBBs hail from an arid region, these wet, stuffy enclosures often proved fatal. GBBs should be kept on dry substrate in well-ventilated enclosures. 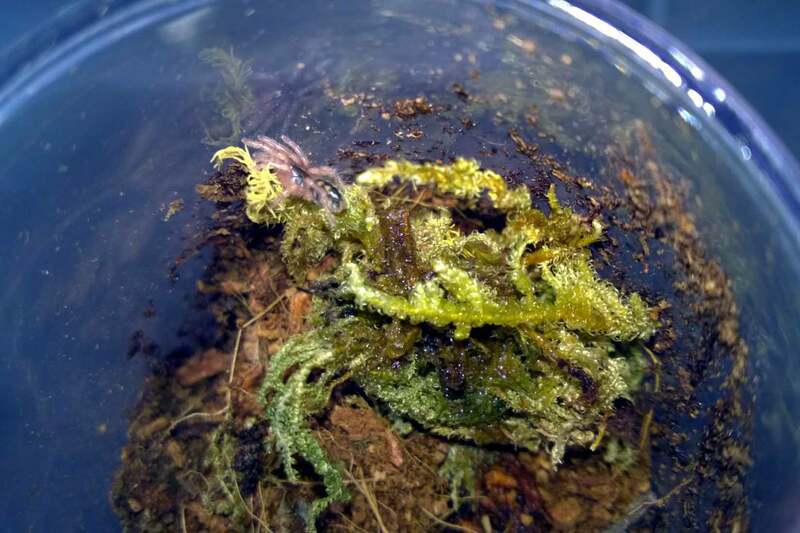 As slings are more vulnerable to dehydration, you can moisten the edge of the enclosure and a corner of the substrate once a week (Do not spray; several drops from an eyedropper will suffice). For juveniles an adults, a water dish will provide any water they may need. Although slings may dig a bit, most GBBs will construct elaborately-webbed dens using any supplied cork bark hides or furnishings for anchors. Although this species has been referred to as a semi-arboreal, this not true— this is a terrestrial species. However, if provided with an enclosure with some height and taller furnishings (cork bark, vines, plants, etc), many GBBs will web up these and choose to perch themselves above the ground. The two juveniles I keep are often in their webs just an inch or two above the substrate. 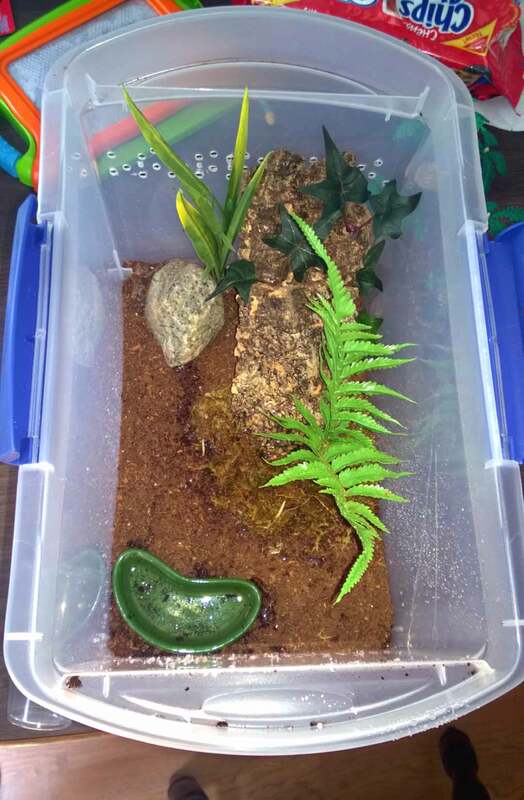 My young adult female’s enclosure. Notice the copious amounts of webbing. Some keepers see this behavior as a sign that this is an arboreal species, when instead it’s likely an animal making the best of the surroundings it has been provided. As a terrestrial species, a fall from too high up could injure this T, and care has to be taken to insure that distance between the substrate and the top of the enclosure is not too high. This species should not be set up as an arboreal due to their skittishness and increased chance of injury from a fall. My two juvenile GBBs are kept on dry coco fiber substrate with cork bark slabs and water dishes provided. They do not use the cork bark as hides, but instead as anchors for their copious webbing. 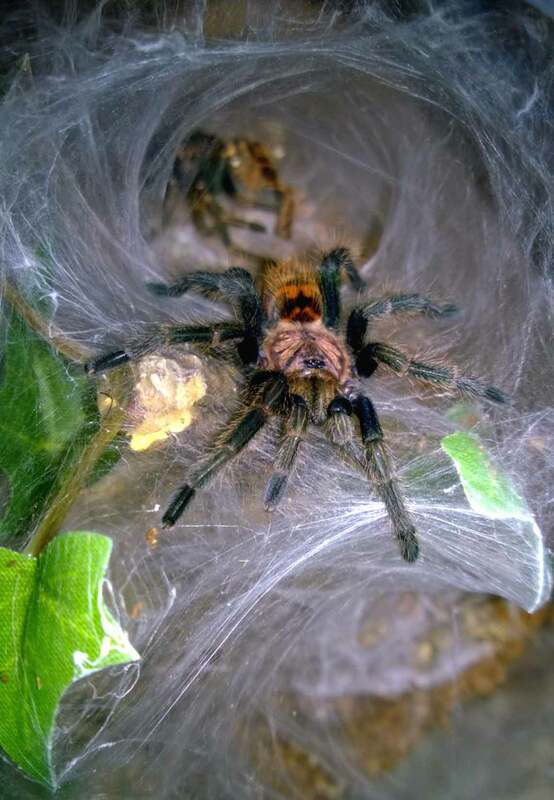 Even as slings, these two liked to fill their enclosures with thick layers of web. Despite the webbing, both usually sit right out in the open, remaining highly visible and making for fantastic display animals. Like most of my Ts, my GBB is kept at normal room temperatures. During the summer months, temps range from the low 70s at night to low 80s during the day. In winter, it’s low 70s at night, mid 70s during the day. They seem to eat well all year round, unlike other species I keep that slow down during the winter. 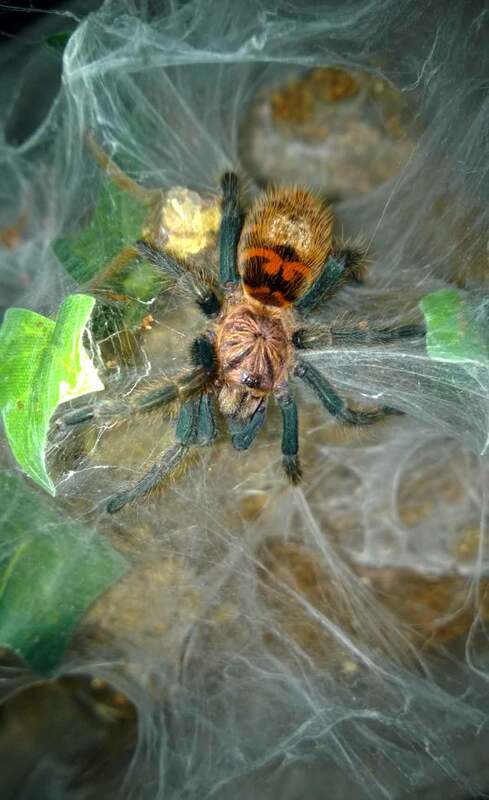 Part of a GBB’s hardiness comes from its excellent prey response and appetite. My two GBBs are, by far, two of my most vicious hunters. Because of the extensive webbing, they generally feel the vibration of the cricket or roach the moment it is dropped into the enclosure. I’ve had several instances when a cricket was snatched up the second it hit the substrate. They are fast and deadly, tackling and subduing prey items ferociously and efficiently. Out of all the species I keep, the GBB is in my top three of Ts I most enjoy watching hunt. When slings, I would feed my specimens one small cricket every three or four days. As juveniles, I offered one medium/large cricket twice a week. The only time either has ever refused a meal is when in pre-molt. Their growth rate was medium to fast, with frequent molts bringing moderate changes in size. 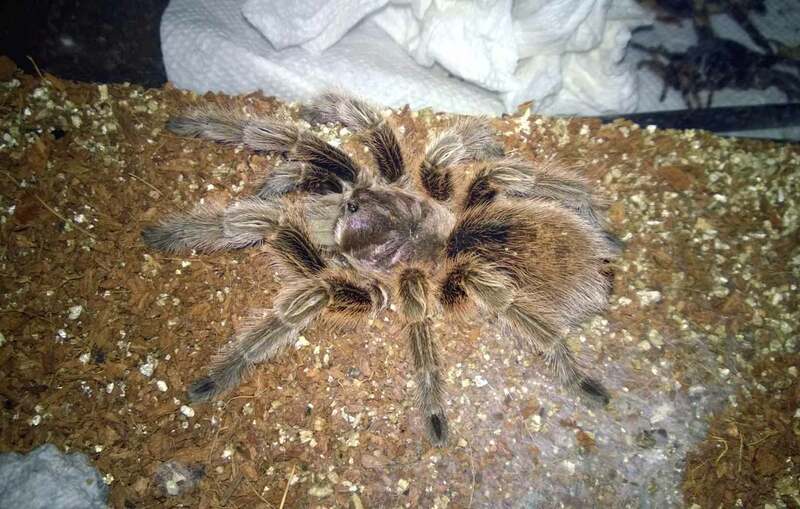 During its first year with me, my oldest GBB molted six times and in that time it went from .75″ to 2.75″. Molts usually came about every two months during this period. As young adults, their molt schedules slowed down to about once every four months or so. Behaviorally, the young adults are a bit more skittish and prone to kicking hair at the slightest disturbance. Now that they are both around 4″, I feed them two large crickets once a week. The GBB’s hardiness, ease of care, and affordability might make one think that it’s a great starter species, and in some respect that is true. 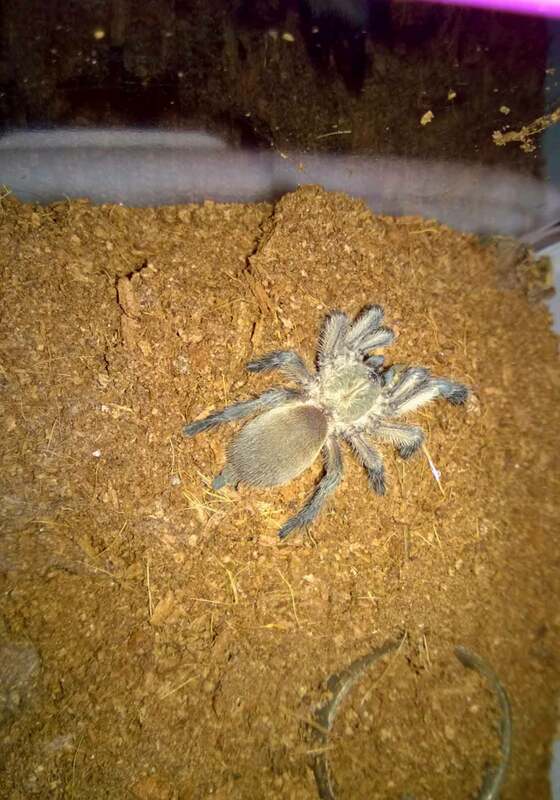 However, this is a tarantula with some speed that also has a reputation for being skittish. I have never seen a threat posture or any type of defensive display from my specimens, and they have never been aggressive. As adults, however, they do like to kick hairs and will eventually bolt if disturbed. A keeper used to slower, calmer species may not be ready for a spider that may be out of its cage in the time it takes them to blink. Rehousings can be particularly fun, as the GBB is prone to bolting unpredictably in any direction BUT the one you want it to go in. That being said, a keeper new to the hobby who practices caution and care should have little problem with this beautiful species. Since getting into the hobby, I’ve spent a lot of time (more than I’d like to admit) experimenting with various substrates. 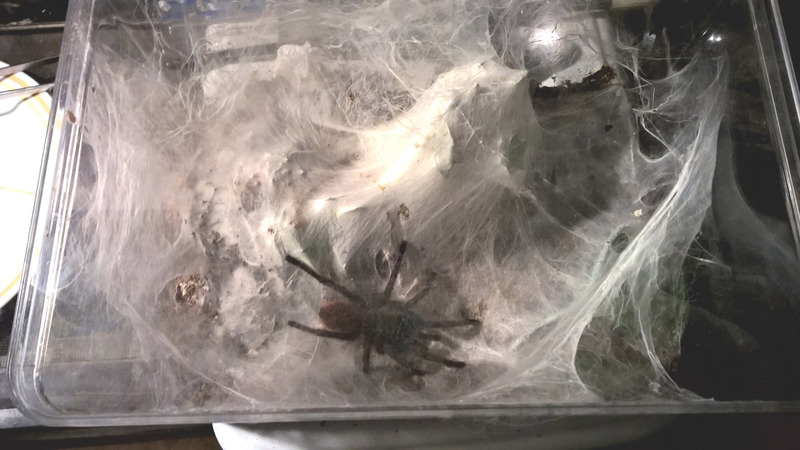 When I bought my first T about 18 years ago, the popular choice for spider bedding was dry vermiculite. A lot has changed since then, however, and better (and more appropriate) options are now recommended. 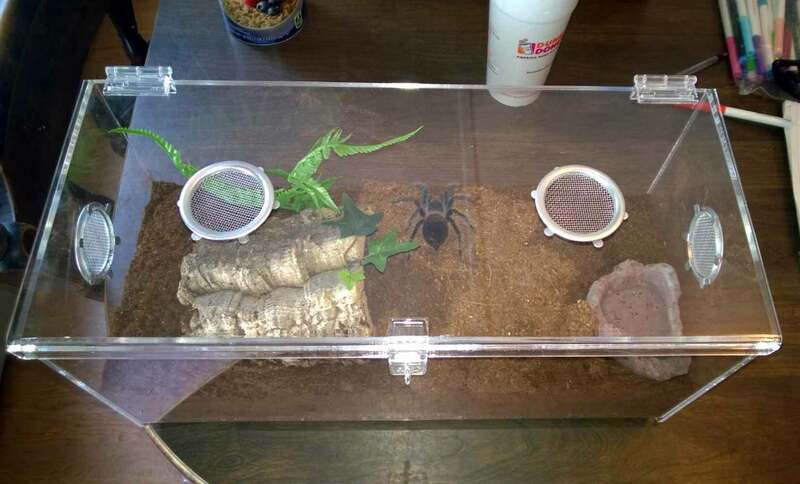 Ask any group of tarantula keepers what material they choose to keep their prized pets on, and you are likely to get a variety of responses. 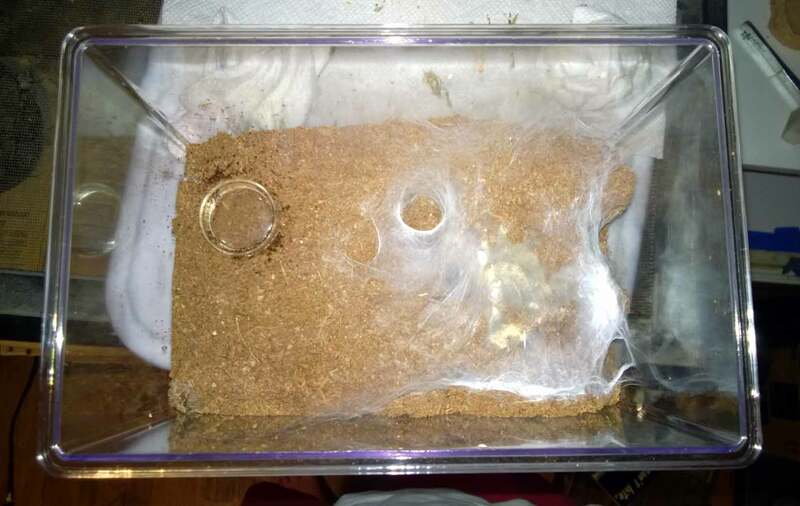 A recent poll on the Arachnoboards forum did reveal that there are a handful of popular choices that tarantula keepers mix and match to get the properties they desire. Much is up to personal choice, and I actually find it quite fun to experiment with different combinations. What follows is a list of some of the more popular choices as well as some pros and cons of each. 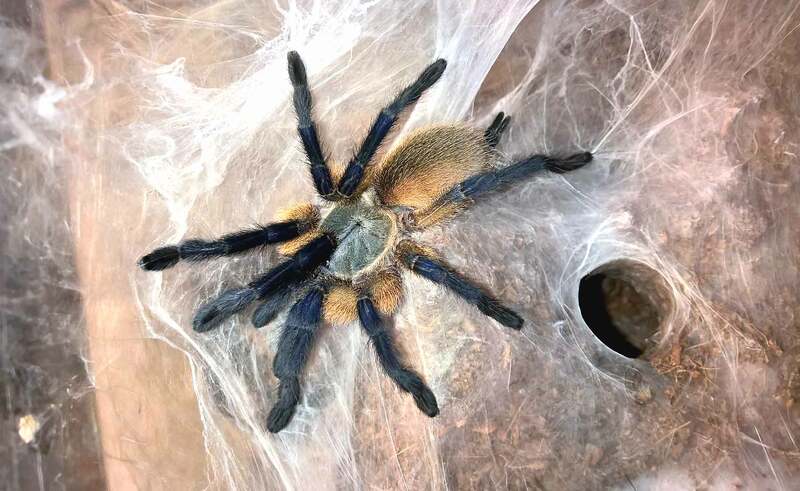 Made from ground up coconut husks, and sold loose in bags or in compressed bricks, coco fiber substrate has become one of the most popular substrate choices for those who keep tarantulas. Although the bags save you the effort of having to re-hydrate the compressed bricks, they are much more pricey. Zoo Med’s Eco Earth is probably the most popular brand, but other companies also produce the bricks (and some are less expensive). Absorbs water well for species that need some moisture. Great when used dry for arid enclosures. 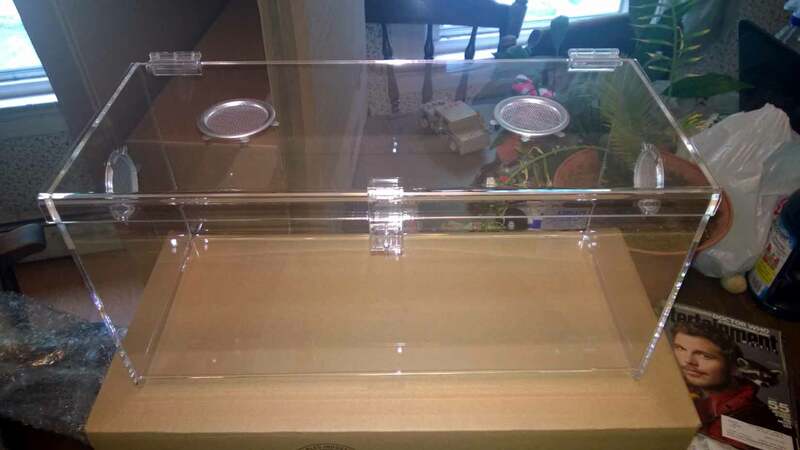 Can become expensive when filling larger enclosures. Re-hydrating the bricks can be a bit time consuming and messy. When dry, it can be “fluffy” and more difficult for burrowing species to create homes. Regular old run-of-the-mill topsoil can be a great and inexpensive substrate choice. It can be purchased at any Walmart, Home Depot, or Lowe’s in large bags for only a couple dollars. If using topsoil, it’s important to make sure that it’s organic with no fertilizers added (this includes animal waste). I have found myself using top soil mixes more and more due to the cost-effectiveness, availability, and water retaining qualities. It should also be noted that many European hobbyist have been using regular topsoil from their yards for years with no ill effects. Very inexpensive (a .75 cubic foot bag runs about $2.25). Mixes well with other substrates to get desired properties. Packs down well; good for burrowing species. Very heavy when used to fill larger enclosures. If used straight up, spraying/moistening of the substrate can create puddles or mud. It does not absorb water as well as other substrates. Peat moss is another readily available and inexpensive substrate alternative. Again, it can be purchased in a variety of places, and the large bags are very convenient for filling up large enclosures. As with the top soil, you want to go with a product that is organic and contains no fertilizers. Absorbent when wet down for species requiring moisture. Mixes well with other substrates. Like top soil, the quality from bag to bag can vary. Large chunks or sticks must be filtered out. Can be prone to growing mold or fungus. As stated earlier, these three are the top choices among enthusiasts, and each can be used alone, or they can be mixed and matched to create a substrate to fit any need. For the majority of my enclosures, I’ve been using a 50/50 mix of coco fiber and peat moss. This has become my “all-purpose” substrate for many of my specimens. Although the days of using vermiculite as a substrate for my Ts are long over, that is not to say that it can’t be very useful. For species requiring more moisture, I put a 1/2″ thick layer of vermiculite on the very bottom of the enclosure, then mix some in with the 50/50 coco/peat combination and use that to fill the rest of it. I find that the vermiculite retains water better than coco or peat alone, and allows for better water percolation. This enables any water I pour in to filter down to the bottom, keeping the lower levels humid and moist like the tarantula’s burrow in the wild. For Ts requiring more humidity, this also allows the water to evaporate more slowly, elevating the humidity inside the enclosure as it does. The trick is to not add too much, as overdoing it keeps the soil “fluffy” and prevents it from being packed down well. Vermiculite is relatively inexpensive (an 8 quart bag costs about $3.99), and I always keep some on hand. Sphagnum moss is another useful additive when you are trying to maintain humidity in an enclosure. Moss absorbs water like a sponge and holds onto it quite well. When used inside an enclosure, it can be wet down to provide a source of humidity. I like to place some around water bowls to soak up the overflow. Although various mosses are produced by reptile supply companies, clean organic horticultural moss can also be purchased at Walmart, Home Depot, Lowe’s, and gardening supply stores. Anything with jagged sticks or pieces. These could be harmful to the tarantula, as a falling T could rupture its abdomen on something sharp. 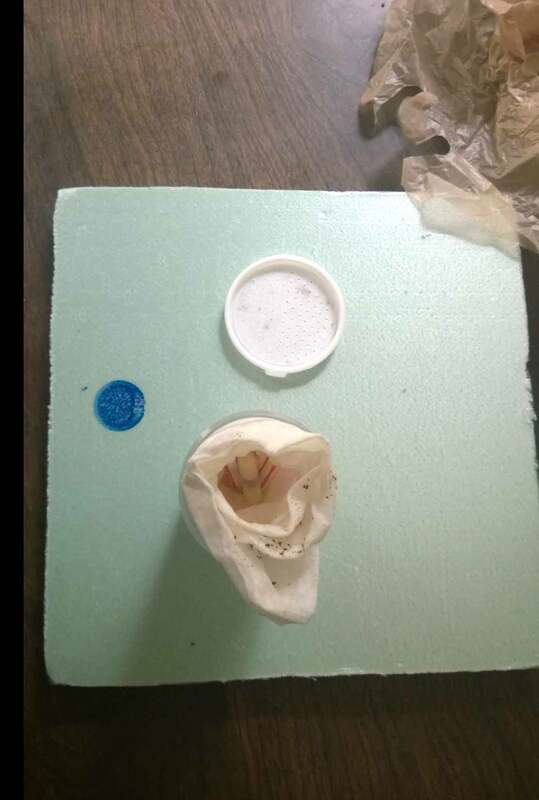 If you buy substrate with jagged pieces, they must be removed before use. Substrates with with fertilizers or additives. Make sure to check the labels before you buy. Even some “organic” soils have natural fertilizers added, including animal waste. Aquarium Gravel. Although used for years, its use as a substrate is now generally frowned upon. Besides holding water too well (it tends to puddle and stagnate beneath the surface), it can trap a tarantulas leg or prove hazardous in a fall. 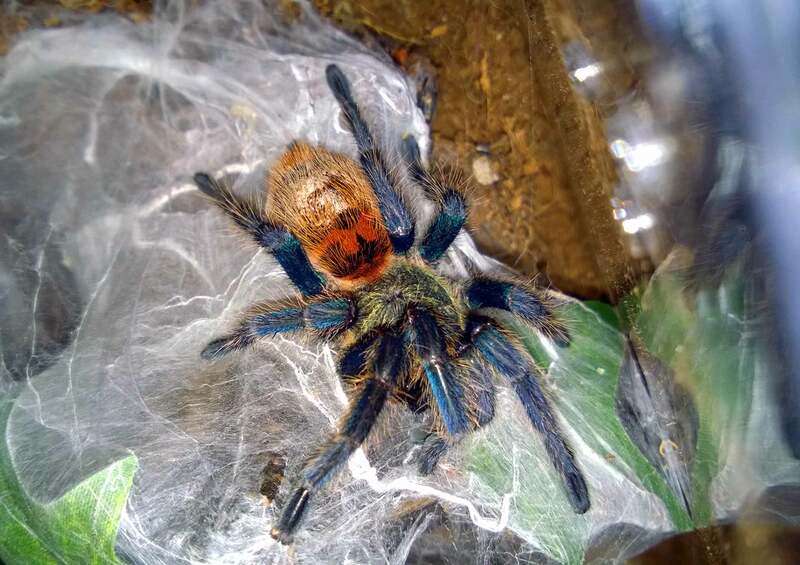 C. cyaneopubescens and P. cancerides Molts – Pictures! 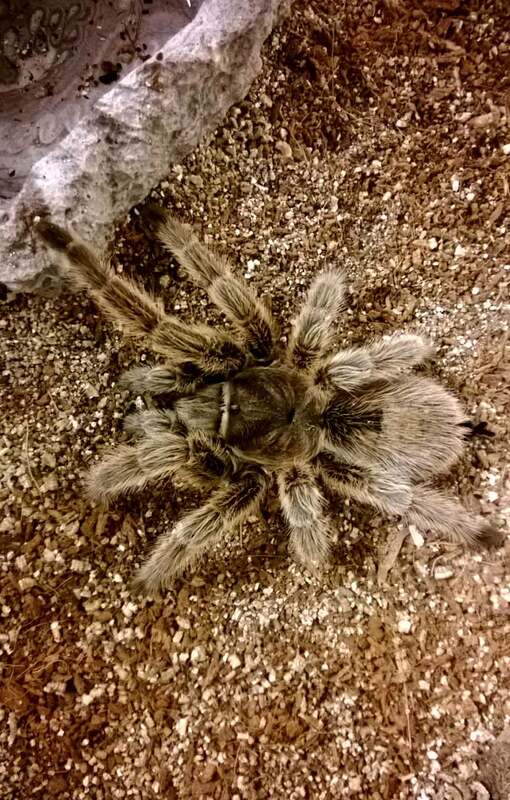 With the warmer summer weather, and temperatures now consistently in the mid-80s, my tarantulas’ metabolisms have kicked into high gear. This means more eating, more growing, and more molting. 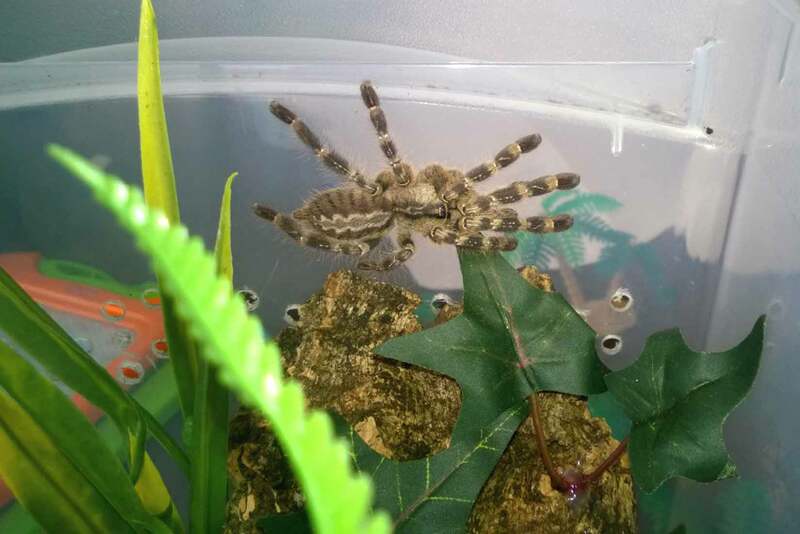 In the past two weeks alone, 14 of my spiders have molted, and some of Ts I picked up as .75″ slings are now creeping closer to their adult colorations. 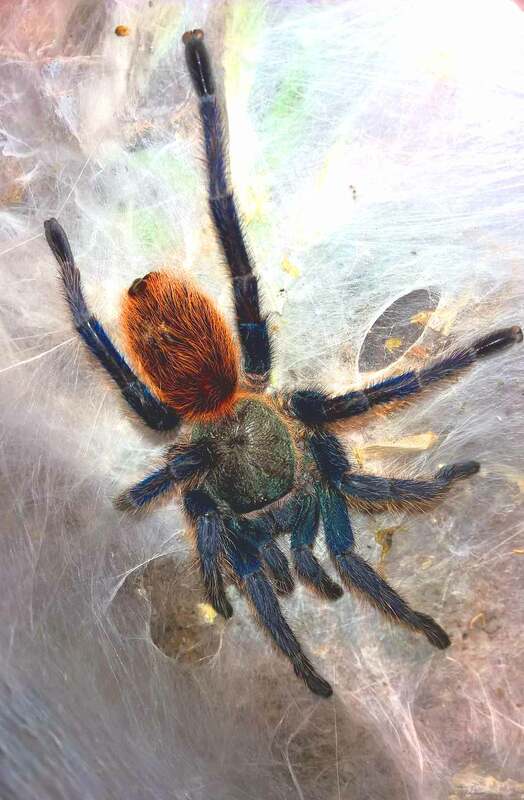 My juvenile C. cyaneopubescens (or GBB), one of the first two slings I purchased as a .75″ sling in October of 2013 is now 2.5+” and is sporting more of the adult orange on its abdomen and more blue on its legs. 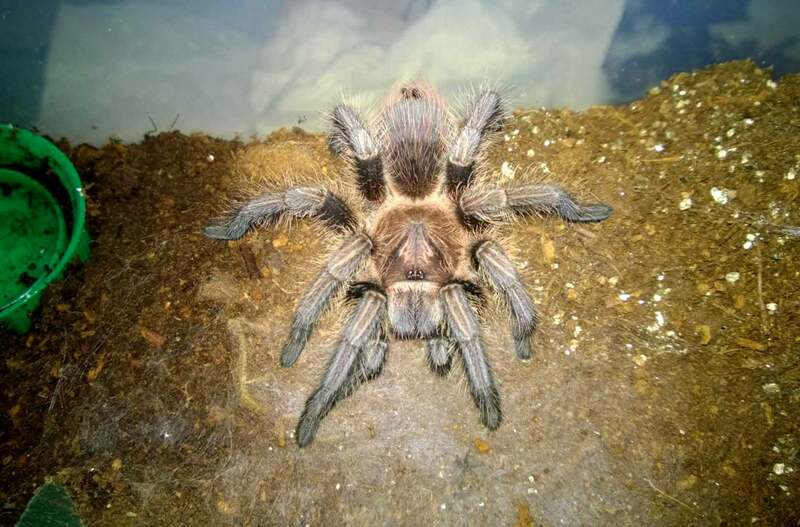 2.5″ after a recent molt. My juvenile P. cancerides (Haitian Brown) also molted again. What once was a striking little dark blue sling is now a 3″ juvenile will beautiful bronze and pink tones. These little guys have rapidly become one of my favorite species, and I very much enjoy watching the color changes as they grow into adults. 3″ P. cancerides after a recent molt. Both of these Ts have undergone amazing color changes as they molt toward adulthood, and I will be eagerly awaiting what metamorphosis the next molts will bring. NOTE: THIS VENDOR IS NO LONGER IN BUSINESS! After being burned once on a transaction with a private party selling Ts, I’ve been a bit gun-shy to order from anyone but established and reputable dealers. 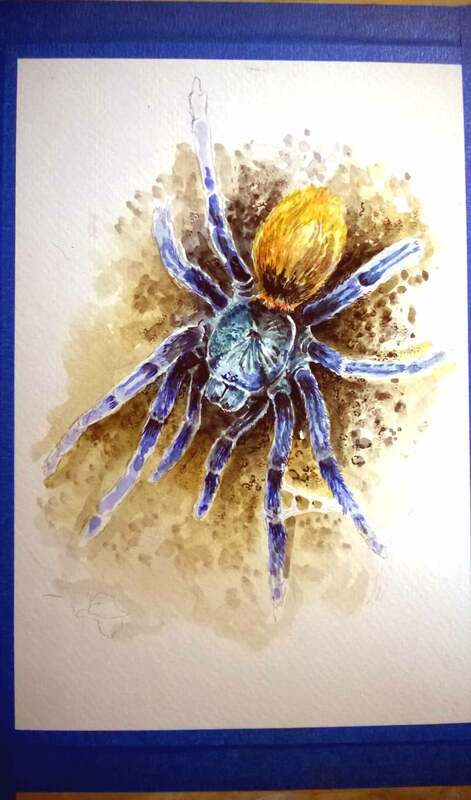 However, while perusing the For Sale/Trade/Want To Buy section of arachnoboards, I stumbled on an ad for .5″ Hapalopus sp. Columbia Large (Pumpkin Patch) slings for an amazing price of $18 each. Now, I had been pricing this species out for months, and the cheapest I had found them for was about $35 for 1/3″. I knew the vendor, Autumn, from the boards, but I wasn’t aware that she had started selling. I checked her review thread, and found glowing reviews going back several months. Interested, I clicked on a link to a very clean website offering several types of slings and many cool sling packages. The prices were outstanding, and the shipping charges were the lowest I had seen. 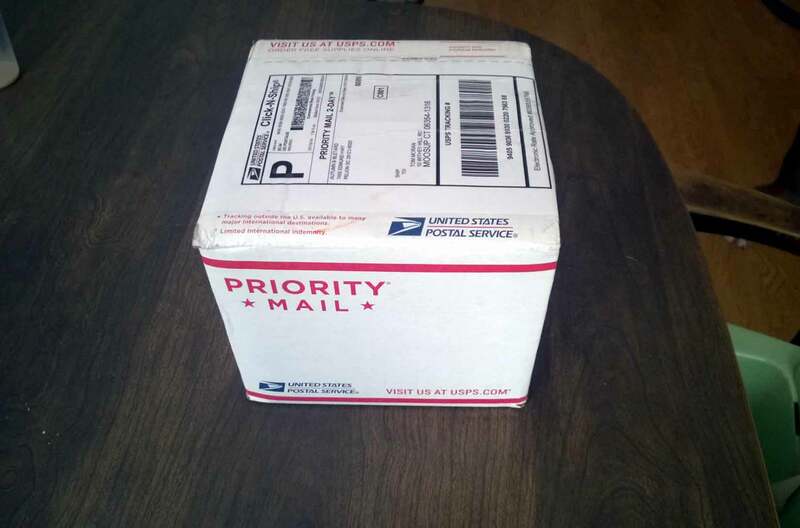 For $10, she was offering Priority shipping with LAG. Even better, if you spent $50, Priority shipping was FREE. Wow. For those who didn’t want to chance a two-day journey, Autumn also offered overnight shipping for a very reasonable $35. 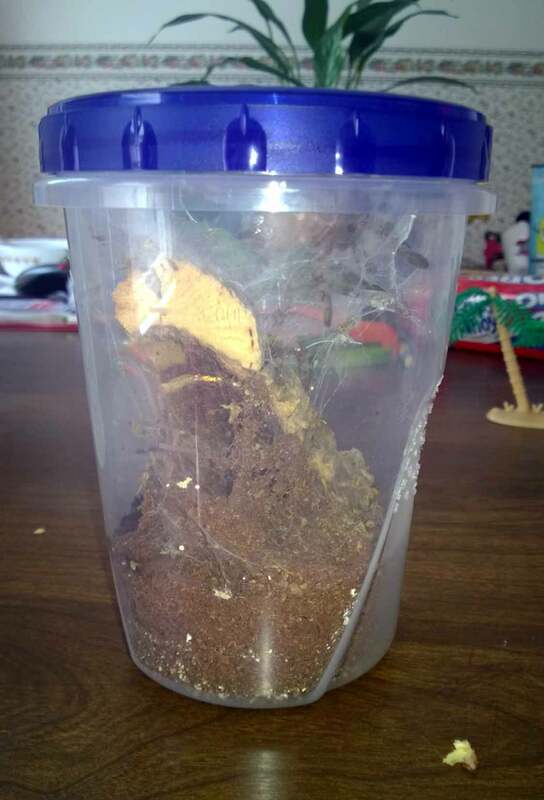 I ordered three Hapalopus sp. Columbia large slings. Not only were the spiders VERY reasonably priced, but I got the free Priority shipping with LAG on my purchase as it was over $50. On top of that, I even got a free B. albopilosum sling. To call this transaction a bargain would be an understatement. Autumn’s communication throughout the entire transaction was amazing; she is very pleasant and affable. Corresponding via text (phone is also an option), she kept me updated on my order and even asked which freebie I wanted. The tracking information was texted directly to me, which was very convenient. 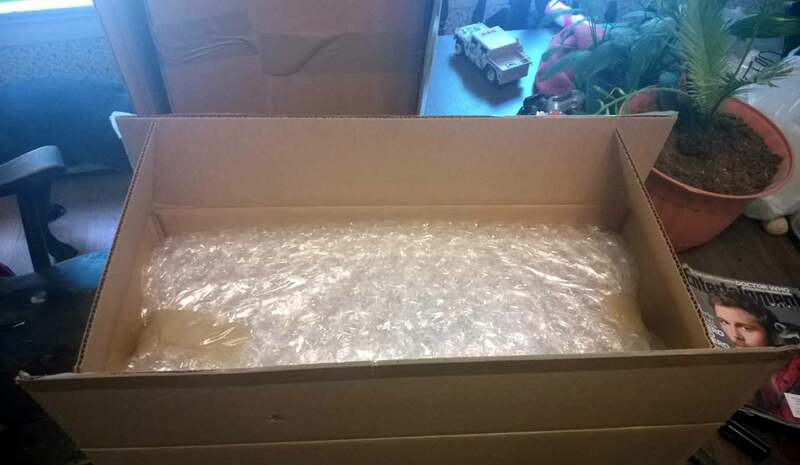 Shipping was prompt, and the packing was EXCELLENT. The slings were first nestled safely inside straws, then the straws were wrapped in moist paper towel and enclosed in a larger dram bottle. 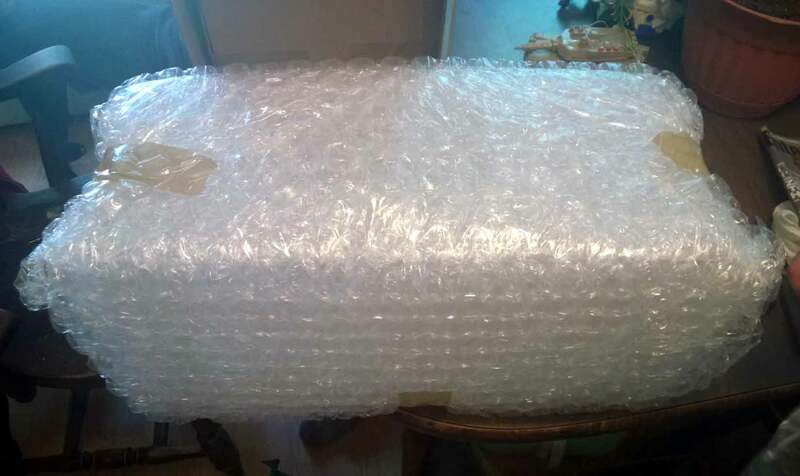 The bottle was packed and padded in a foam-lined Priority box. These little guys were very well protected. Packing from Autumn’s Eight-Legged Experience. Packing from Autumn’s Eight-Legged Experience. 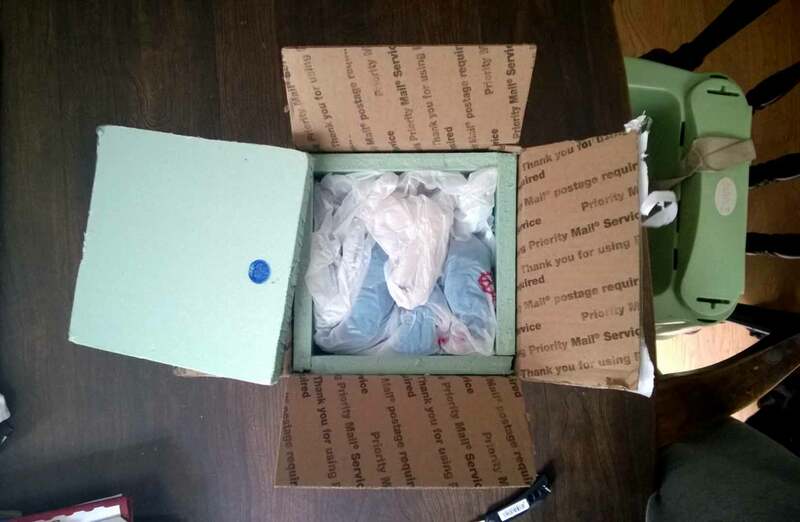 The box is foam-lined and the slings are cushioned by bags. 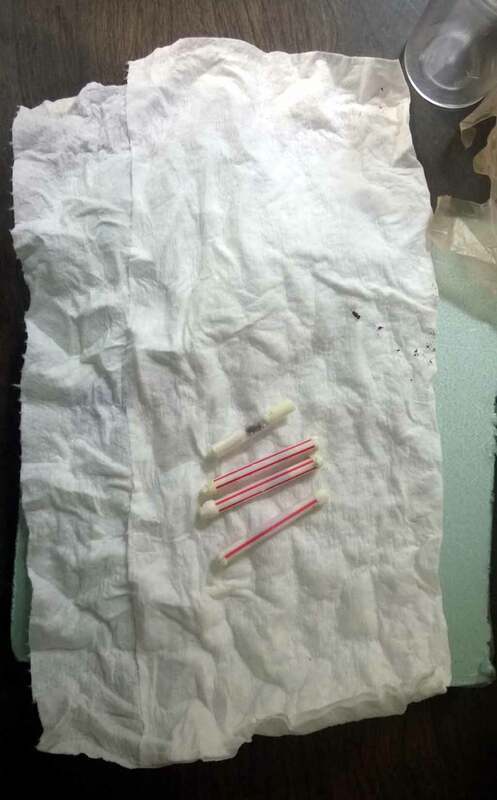 A peek inside the dram bottle shows the straws containing the Ts. These are cushioned by moistened paper towel. The straws containing my tiny slings. 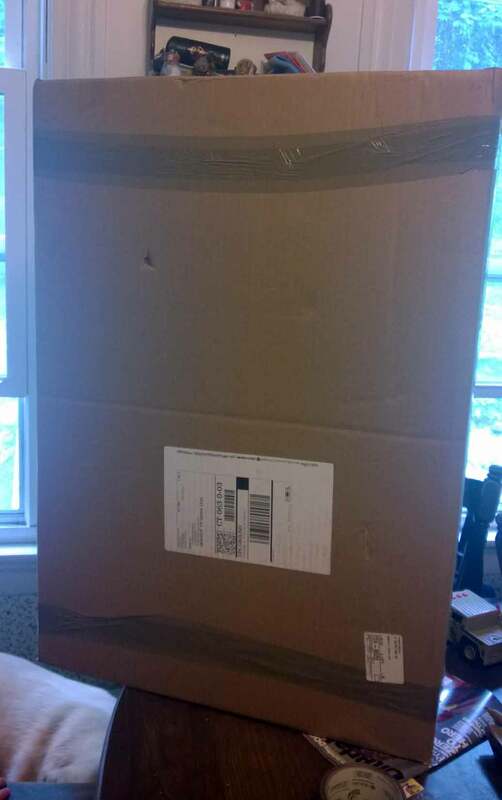 This was a wonderful packing job. My new acquisitions arrived lively and in great shape; it’s obviously that they have been well cared for. Three of the slings have already taken a prey item. I won’t hesitate to order from Autumn again, and I highly recommend her. Her prices, service, and packing are EXCELLENT. I’m glad to have discovered this new dealer. Visit Autumn’s Eight Legged Experience Now! A 1/2″ H. sp. Columbia sling purchased from Autumn’s Eight-Legged Experience.